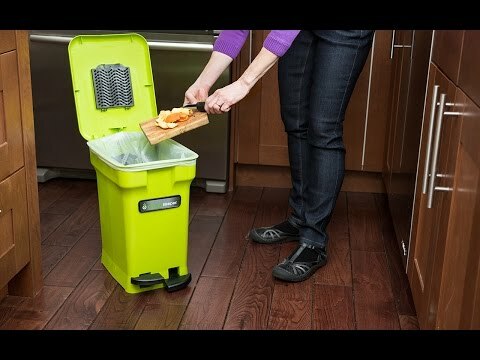 The CompoKeeper Food Scrap Collector is an innovative kitchen compost bin that keeps odors in and bugs out. Hands-free with interlocking bag clamps and removable tote to take out waste without dripping. Dimensions: 10.75" x 13.75" x 16.75"
I move it next to me in the kitchen when I am cooking. I like the compostable bags. Composting is great for the environment. It reduces pollution and erosion, and even helps treat contaminated soil. This keeps chemicals out of our drinking water and garden plants. Unfortunately, composting often means fruit flies and a trash can full of stinky food. Nobody wants that in their home. This is why Van and Kristen Hess, a father-daughter duo from Colorado, came up with a better way to deal with food scraps inside the house. 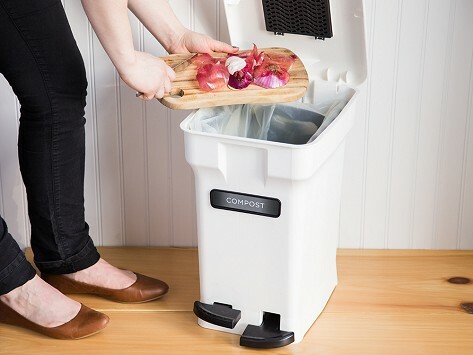 The CompoKeeper is a kitchen compost bin that keeps the bugs away and the smell contained with quadruple-action odor control. This hands-free bin has an activated carbon filter to neutralize odors and an interlocking system to keep the bag closed. The biodegradable bags are breathable, and the removable tote makes it easy and mess-free when taking it to the compost pile. And a six gallon capacity means you have to take it out less often. By eliminating the “yuck factor," the Hess team has made it easy to fit composting into our everyday lives.